But sometimes life teaches you that things you used to love are no longer good for you. No worries, I’m not planning to quit blogging. I’m talking about letting go of things that don’t motivate you to be that better person anymore. That don’t have you pining for more or might even hurt you. In that case, you need to let go at some point. For me, that point has just come with my job. 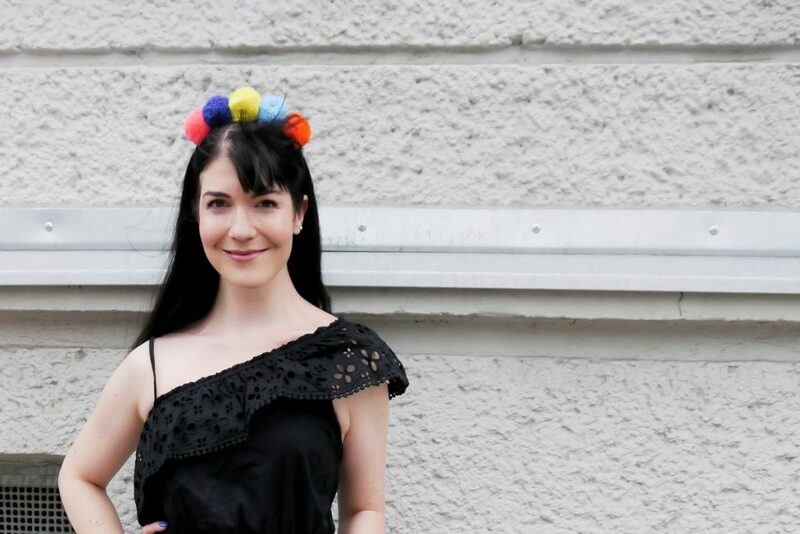 When I saw these pom pom headbands at Asos I knew I would never wear one of them to my job (or anywhere else, in fact, save for the occasional party maybe). I still wanted one, badly. After all, there’s nothing wrong with adding a bit of fun to your life or outfits now and then. That’s probably what you’ll remember most fondly when your life is over one day, not how hard you worked at the office or how devoted you were to your career. Revive what has fallen into hibernation mode, let go of old habits or crappy jobs for that matter. I love the pop of colour the pom poms create so I opted for a plain black dress with just a little tone in tone embroidery. 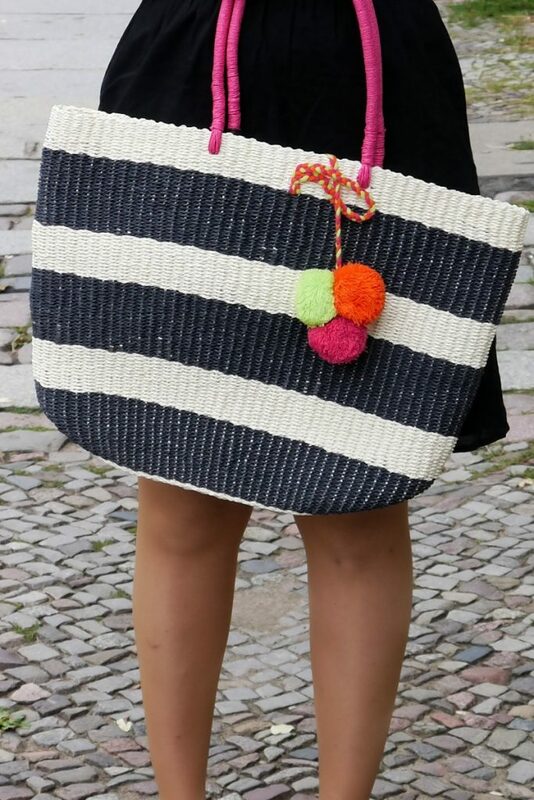 And one of my latest loves – a straw bag. And yes, it was pretty windy when we were trying to shoot this outfit but I think that’s kind of fitting the general mood here. Have you ever been stuck in an awful job? Hope your week is going great guys! Hey, was ein tolles Outfit! I love the pom pom head band! That’s super cute! And I agree about letting things go that don’t make you happy. I am still learning on how to let go in a lot of areas but I will always be a work in progress. I agree with everything you said on the matter. Sometimes we just hold on to things for nostalgia or how it used to make us feel. Then we get stuck in a rut and become complacent. I like the idea of adding a bit of fun to your life wherever you can. Your playful headband is cute and quirky and shows that you are willing to step out of the box. I absolutely love the pom pom headband it’s so cute! I’m sure there’ll be some occasion you can wear it for – I can imagine it looking cute at a garden party or something! I agree that we should let go of things that don’t make us happy. That pom pom headband is super cute! Such a lovely and fun look! Love the dress so much and the pom poms make it nice and colourful. I totally agree with letting negative influences and factors go .. they only detract from your quality of life. Zu deiner letzten Frage: ja! Es ist nicht immer einfach, etwas loszulassen oder zu ändern, was einem eigentlich nicht gut tut. Das ist seltsam… ich glaube inzwischen, es hängt damit zusammen, dass wir unsere eigenen Möglichkeiten, unsere Macht nicht erkennen, und denken, wir könnten es nicht ändern… Liebe Grüße!